Mexican Bush Oregano - (poliomintha longiflora) Also called Rosemary Mint. Spicy leaves are used in mexican cuisine. Long tubular lavender colored blooms attract hummingbirds. 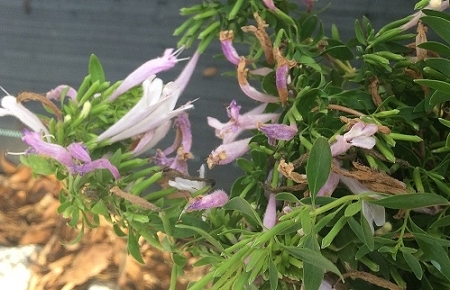 Shrubby plant can grow to approx. 3' x 3' and is drought tolerant and deer resistant. Perennial in zones 8-11. Live plant in 3 inch container.